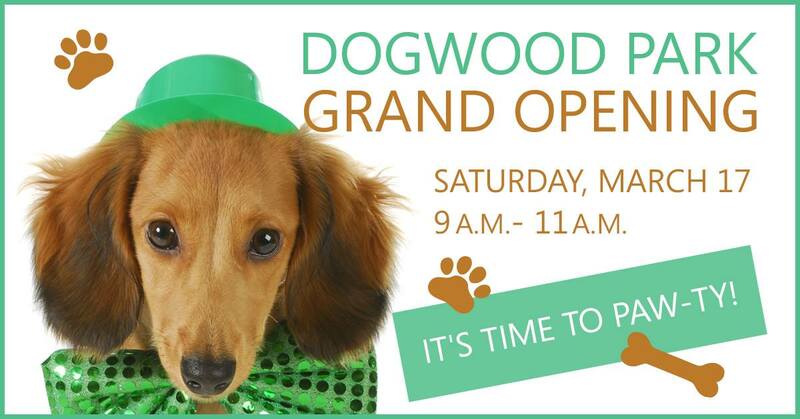 Local developer Pardee Homes will host a grand opening paw-ty for the new Dogwood Park dog park in the Aliento neighborhood of Canyon Country on Saturday, March 17 from 9 a.m. to 11 a.m.
Organizers invite the SCV community to attend the free event and encourage residents to bring their pets in St. Patrick’s Day costume. Shelter Hope Pet Shop, the nonprofit pet rescue and adoption located at the Valencia Town Center Mall, will host a booth and feature pets available for adoption at the event. Other pet-related vendors participating include Kriser’s, Kupcake Kitchen, Stuffed Crepe, Lazy Dog Cafe, and Pet Me Happy Treats. A live DJ from Behind the Booth will provide live entertainment. Dogwood Park is located on the corner of Oak Crest Drive and Big Cedar Drive in the Aliento development. The closest address is 18625 Juniper Springs Drive. From Highway 14 north, exit Golden Valley Road, turn right, then right on Oak Crest Drive. From Highway 14 south, exit Golden Valley Road, turn left, then right on Oak Crest Drive. Another great spot for a dog 🐶 park would be in the big open field adjacent to Canyon Country park on Soledad. This is a gated community. “The closest address is 18625 Juniper Springs Drive” is only good if you’re a resident of this community. For everyone else, (according to the writer using the Oak Crest Drive entrance) you’ll need to park in the Target lot, and then it’s a 1.25mi walk in to use the dog park. The city agreed to this?